Day 3: Good morning! 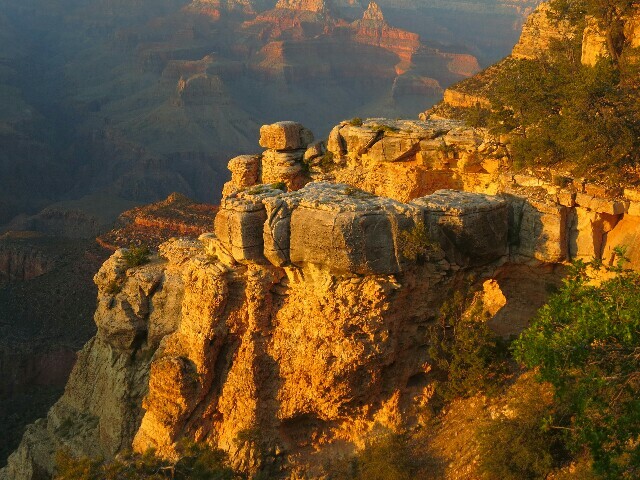 We woke to the sun having risen over the Canyon. Our room, the Roof Garden Suite, had a large private balcony where we could look out over the Hopi House. 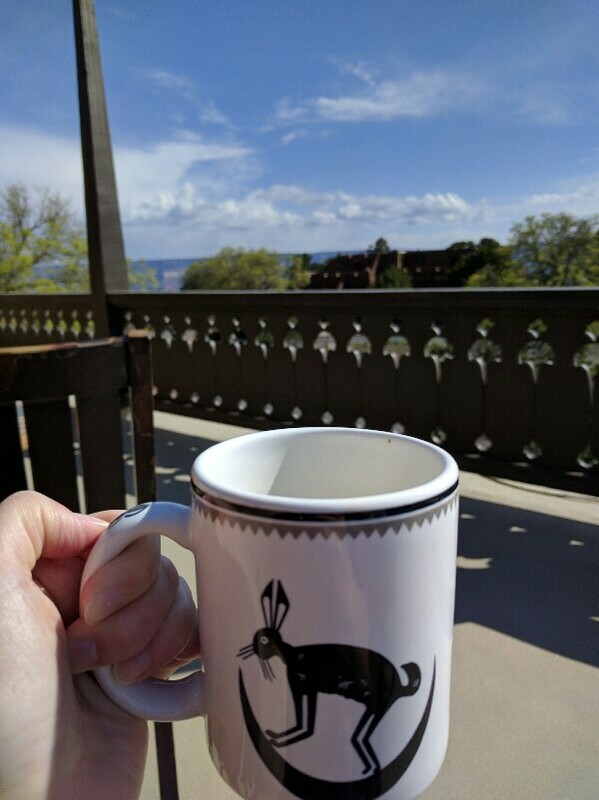 We had a leisurely breakfast, again eating food we purchased at the Whole Foods in Sedona. 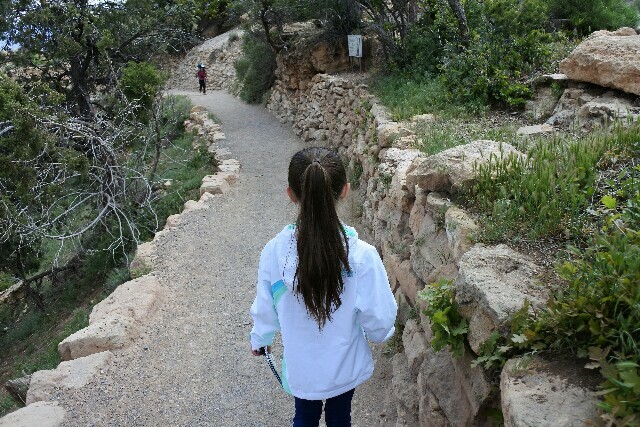 I made sure we filled up our water bottles, packed our cameras (Elizabeth likes to do some photography, too) and we headed out to the Bright Angel Trail. 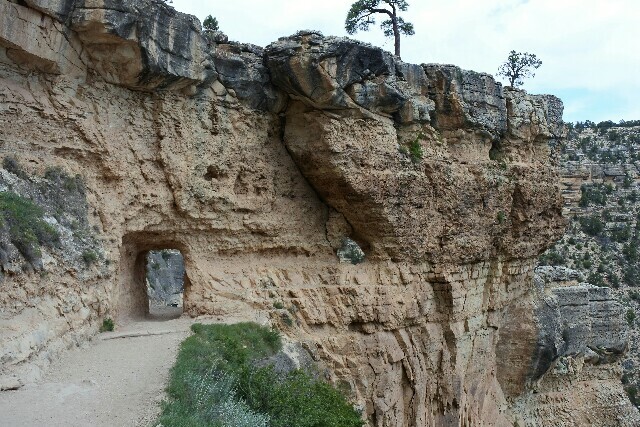 The Bright Angel Trail is easily accessed near the Kolb Studio and is one of the trails that takes you into the Canyon. 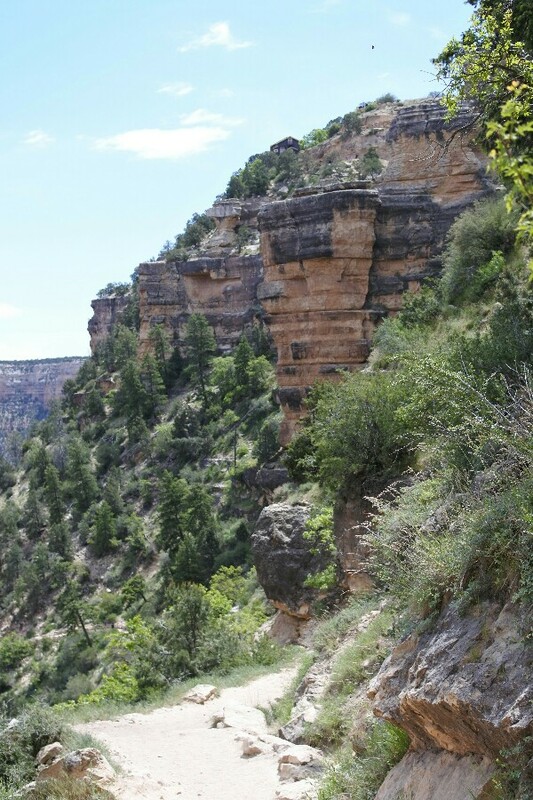 The Bright Angel Trail is long, about 10 miles, and goes all the way to Phantom Ranch on the Canyon floor. Our goal was to walk to the mile-and-a-half resthouse and then head back up the trail. We walked about a mile down the trail, but then decided to cut our hike short when we saw all the people huffing and puffing their way back up the trail. This worked out perfectly for us, by the time we reached the rim again we were tired, but not exhausted. At this time we decided to stop in the Kolb Studio. This was a fascinating place. 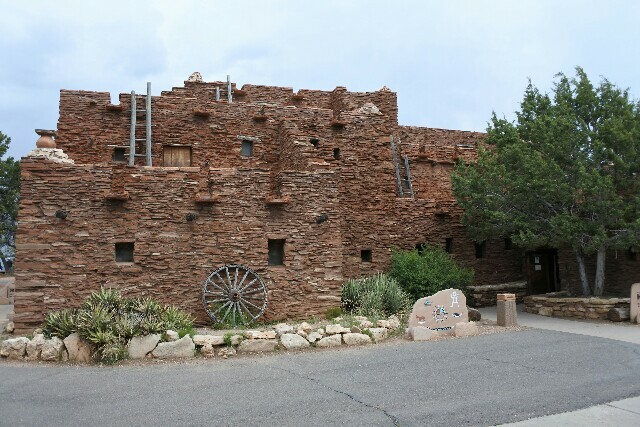 The Kolb brothers, Emery and Ellsworth, built a small building on the edge of the Canyon south rim in 1904. They were photographers and since fresh water on the rim was difficult to find, they built a darkroom for processing film in 1906 near Indian Garden, 4.5 miles away. The brothers would take pictures of mule riders starting out on the Bright Angel Trail, run down to the darkroom, process the film, make prints and then be back at the start of trail to sell these photos to those who had been on the tour when they returned. And I thought my job was hard! Once we had finished at Kolb Studio, we visited Bright Angel Lodge. 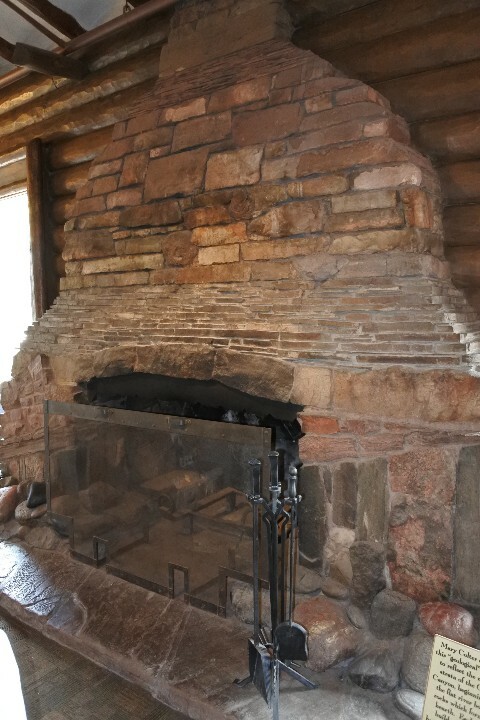 There is a small room of artifacts that also contains the “geological fireplace” designed by Mary Colter. The fireplace rocks mirror that of the canyon layers. Last stop was the Hopi House. It was also designed by Mary Colter and opened January 1, 1905, two weeks prior to the opening of El Tovar. It was used as a store for Native American crafts that were made by artisans on-site. The artisans do not work in the building anymore, but you can still buy a variety of crafts inside. Elizabeth found an awesome handmade doll that became our traveling companion for the rest of the trip. By this time it was late afternoon. We headed back up to the room to relax, play some hangman, and get ready for dinner. I had made dinner reservations (six months ahead if you are a hotel guest or 30 days in advance otherwise) at the El Tovar dining room. It was a beautiful restaurant located on the main floor of the hotel overlooking the canyon. Some people elected to do outdoor seating, but it was mid-60s and breezy so we enjoyed the view from inside. Dinner was fantastic and so was our server, Richard. He took time and answered questions we had about the hotel and told us some great stories about the restaurant. Our dinner finished right around sunset so we ran upstairs, grabbed our cameras and went to watch the sunset. It was beautiful. I found it shocking how the walls of the canyon look so different throughout the day, as well as during the time the sun is setting. Elizabeth took my favorite picture of the sunset using a traditional point-and-shoot camera – which goes to show you don’t need something fancy to get a great image. 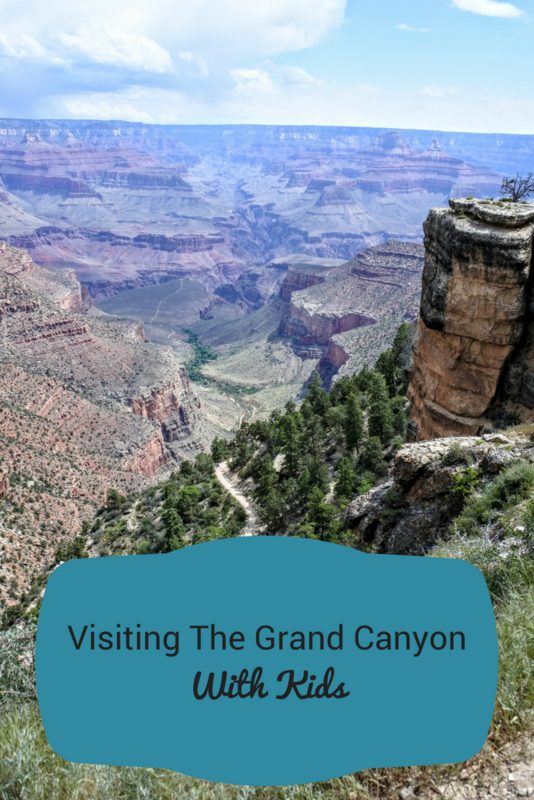 If you have the lead time and resources, I highly recommend staying on site at Grand Canyon Village. Bright Angel Lodge, El Tovar, Kachina Lodge, Thunderbird Lodge and Maswik Lodge are some of the options at various price points. I am hard-pressed to try and describe the peace and serenity of the Canyon when most of the tourists have left for the day. If staying in the Village isn’t possible, there are several options in Williams, Arizona. From Williams it takes a little over an hour to drive to the south rim of the Grand Canyon. 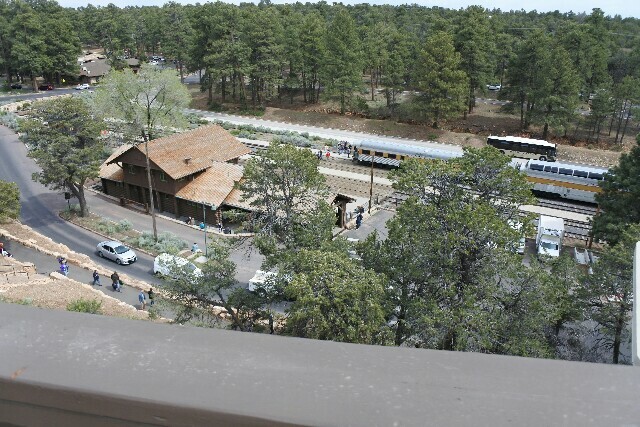 Or there is a historic train that you can ride from Williams that brings you to the train station near Hopi House. After watching the sunset, we made our way upstairs for the night, feeling peaceful and amazed by the day we had experienced in the Canyon. And that feeling lasted right until the moment we realized we had to pack up to hit the road again in the morning.